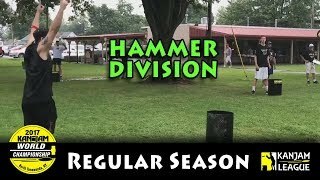 Approximately 100 teams compete in the KanJam World Championship every year. 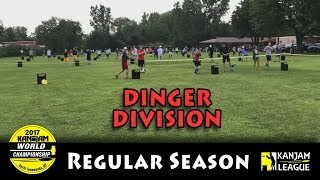 One week prior, a "draft" lottery is held to determine what teams will be separated into one of 4 divisions for Regular Season play. 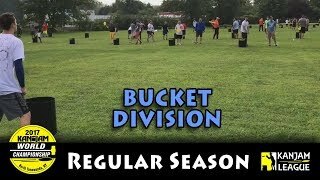 This picks up halfway through the draft - the first half was done as a live stream on Kan Jam's Facebook page at https://www.facebook.com/kanjamfans/videos/vb.98538732628/10155525201717629 - It should be noted that some picks were off camera while we switched from the live feed to the recorded version, so not all 100+ picks are on video. 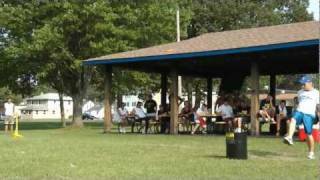 The 2016 KanJam World Championship took place on Saturday, August 13th in North Tonawanda, NY (home of KanJam). The tournament featured teams from the United States (12 states), Canada, and Europe (The Netherlands). 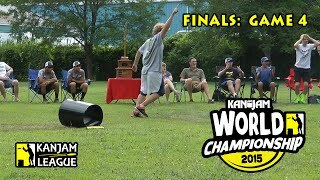 A total of 90 teams competed in the toughest conditions ever in the history of the tournament for the coveted title of KanJam World Champions. 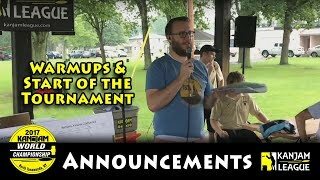 This compilation featured highlights from this epic day, from the beginning opening announcements to the crowning of the 2016 KanJam World Champions. 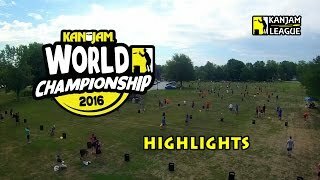 For full results (summary, official team ranks, playoff bracket, and photos), please go to http://www.kanjamleague.com/worldchampionship/champions/2016 The KanJam World Championship is an official KanJam tournament hosted by KanJam. 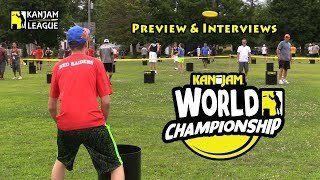 For more information regarding the game, please go to http://www.kanjam.com Music by http://bensound.com - "Clap And Yell" "Happiness" "Badass" and Kevin MacLeod (http://incompetech.com) - "Rynos Theme" "Motherlode" "Clash Defiant" "Undaunted" "Volatile Reaction" "Curse of the Scarab"
Some of the top KanJam players discuss their experiences competing in the KanJam World Championship. The tournament takes place on the second Saturday of August every year in North Tonawanda, NY, hosting the best teams from around the world for a shot at becoming official World Champions of the sport. 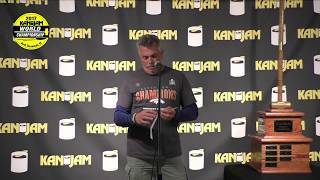 The 2019 KanJam World Championship will take place on Saturday, August 10, 2019. Tournament information and online team registration will be available at http://www.kanjamleague.com this spring. 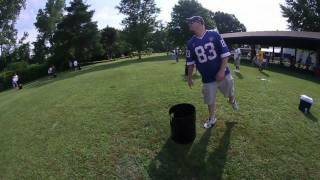 The 2015 KanJam World Championship was held on Saturday, August 8th, 2015. A total of 96 teams from the United States, Canada, and Europe competed. 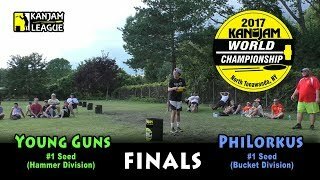 The World Championship Finals featured Don't Bucket Up (Austin Matteson & Connor Matteson) vs defending World Champions, Stallion Survivors (Eric Klavoon & Jon Sandino). 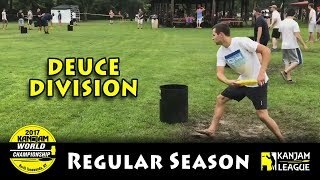 The series went a deciding Game 7 to crown the 2015 KanJam World Champions. Full results online at http://www.kanjamleague.com. Background music "We Are the Champions" by Queen. 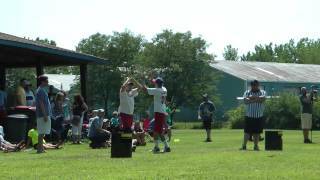 The 2015 KanJam World Championship was held on Saturday, August 8th, 2015. A total of 96 teams from the United States, Canada, and Europe competed. 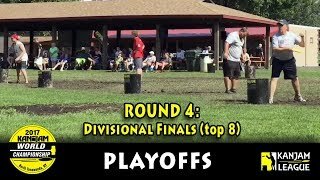 The World Championship Finals featured Don't Bucket Up (Austin Matteson & Connor Matteson) vs defending World Champions, Stallion Survivors (Eric Klavoon & Jon Sandino). In Game 4, Austin Matteson threw a clutch Instant Win to tie up the series. Full results online at http://www.kanjamleague.com. 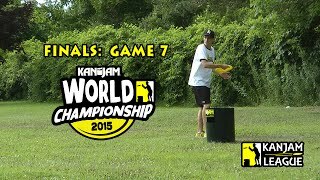 Here is a compilation of the top 10 teams from the 2014 KanJam World Championship. The 2015 KanJam World Championship will be held on Saturday, August 8th, 2015. Registration is available online at www.kanjamleague.com. The 2012 KanJam World Championship will be held on Saturday, August 11th, 2012. Registration is available online at www.kanjamleague.com. 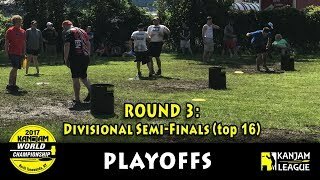 Highlights from the 2011 World Championship - Rebel Survivors defeat Milo's Minions four games to none in the finals to claims their 3rd consecutive title, posting an overall tournament record of 38-6. 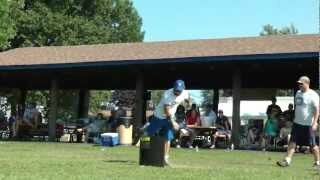 The 2011 KanJam World Championship will be held on Saturday, August 13th, 2011. Registration is available online at www.kanjamleague.com. 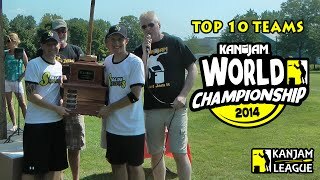 Highlights from the 2010 World Championship - The newly assembled KanJam World Championship trophy is unveiled, which includes the original "hammer." Rebel Survivors defeat Schlotzskys four games to one in the finals to claims their second consecutive title.